Is it really true? Is it really the most balanced athlete who win the decathlon competition? I decided to test this assumption with the results of the previous Olympic Games (Beijing, 2008). I only kept the athletes who have completed all the disciplines so that I can do the study on a data set without any missing values. I used the observations of the scores for each discipline which are calculated according to the time of the distance done by the athlete. If you are interested in those details, you can have a look at the way it is calculated on: http://www.iaaf.org/mm/Document/Competitions/ … _Tables_of_Athletics_2011_23299.pdf. I have been very surprised to see that the winner, Bryan Clay who has an average of 879 points per discipline, did very poorly in 400 meter (865 points), high jump (794 points) and in the 1500 meters race (522 points). On the contrary, he performed very well in 100 meters, 110 meters hurdle and long jump disciplines. Thus, I started wondering if the decathlon was not about power rather than about my so-called balance capacity in all the different areas. Sir Prasanta Chandra Mahalanobis answered to this question some decades ago. In 1936 he decided to create a new function to measure the distance separating two observations. The most common distance is the Euclidian distance. However, this distance does not take into account two important elements. The first element is the variance of the different variables. Indeed, let’s consider the high jump discipline and the pole vault, a gap of 30 centimeters between two athletes is huge in high jumping whereas it is a reasonable difference in pole vault. The reason is easy to understand, the variance in pole vaulting discipline is higher than in high jumping. Fortunately, most of the robustness to the variance is taken into account by the international athletic association (the federation who sets the scores) – although we will see that this is not perfectly true. But there is another problem which is even more important. The correlation of the different disciplines. 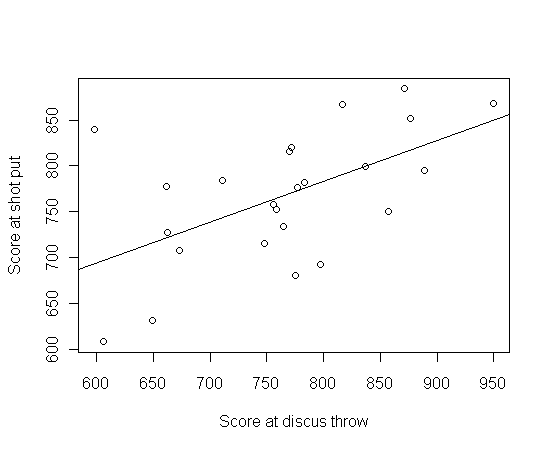 For example the following graphic shows a positive correlation between shot put and disc throw, which, if we think about it, makes sense! Thus, if we look for the most complete athlete, there should be no cumulative rewards – we don’t want to give athletes too many points when they have performed well in two very similar disciplines. On the contrary, if two disciplines are negatively correlated such as 1500 meters and 100 meters we want to give extra points to athletes who perform well in both of the disciplines. The Mahalanobis distance has been created in this purpose. Once the matrix S is computed, we can calculate the Mahalanobis score for every athlete – say the distance between zero and the scores of the athlete in the different disciplines. It was unexpected to see that the gold medal would be claimed by Oleksiy Kasyanov who has finished 7th during the Olympic Games. On the contrary, Bryan Clay the Olympic champion would now rank 5th. You can find below two tables, the first one is the ranking of the athletes according to the Mahalanobis distance, and the second one is the official decathlon ranking. As you can see they are many differences. Therefore, decathlon is not the ultimate sport of complete athlete. To leave a comment for the author, please follow the link and comment on their blog: ProbaPerception.